Thank you again to everyone who entered the 2018 MOTUC Character polls, where you voted to help determine future releases. During the polls, everyone had a chance to enter to win a random prize from Super7. The winners have all been selected and the prizes all mailed. How do you want Filmation characters to be released in the Collector's Choice and Club Grayskull lines? For upcoming MOTUC Club Grayskull & Collectors Choice figures, do you want Super7 to do all new packaging? Or continue the same packaging used over the course of both the CG and CC releases? Would you like to see Super7 do more Ultimates? And if so, would you like to vote in a poll to help select them? Are you interested in another Create-A-Character contest where fans can submit ideas that could potentially become new characters? Given the current prices of MOTUC from Super7, would you pay $5.00 more to get minicomics with the figures? Would you pay $25.00 to $29.00 for a Classics weapons pack from Super7? Considering the price would probably remain close to the $80.00 they were previously from Mattel, would you like Super7 to continue the MOTU Giants line? Given that the last subscription pre-order for MOTU Mini-Masters 2-packs failed at $20.00 each, would you pay upwards of $40.00 per 2-pack to get the unreleased Mini-Masters? Are you interested in a MOTU M.U.S.C.L.E. ring and accessories being offered by Super7? Would you buy MOTU novels in either paperback or e-reader format? Accessories Round 3 voting is live! Accessories Round 2 voting is live! Here are the top 20 results from the 2018 oversized item poll, and a link to vote on ROUND 1 of the accessories poll which will have three rounds. ALSO, there will be one more poll after the Accessories polls. 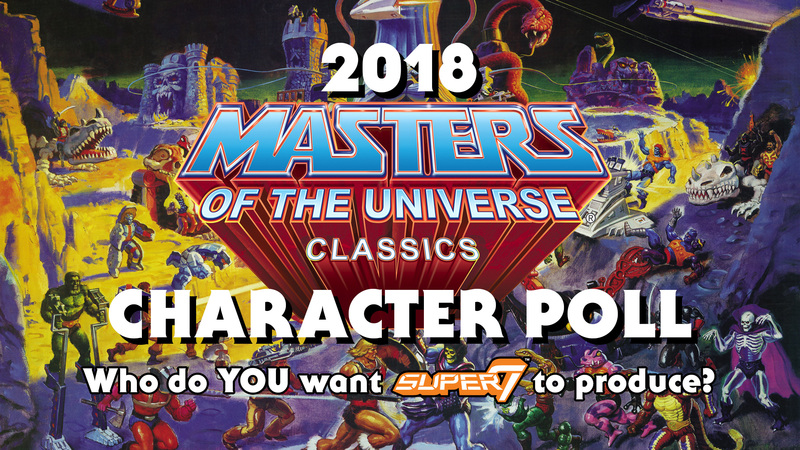 This poll let's you pick which characters released thus far in MOTUC you'd like to see in Super7's upcoming retro-styled 5" action figure line. You won't want to miss that! When all the voting is done, we'll be announcing random winners from each round who each get a free gift from Super7. So be sure to enter your e-mail address when you vote. Here are the results from the final ranking of the top 30 characters from the 2018 character poll, plus the second tier 30 (places 31 thru 60), and a link to vote on ROUND 2 of the oversized items poll. This year's poll was interesting. Once we got past position 31, the number of votes between positions got closer and closer. In fact, from 32 all the way to up to about position 132, popularity was fairly close. How will this play into next year's 2019 poll remains to be seen. Will certain characters pull ahead from the pack as the new front-runners? Or are we at a point where we start having similar popularity between numerous contenders for this amazing line that has run for nearly 10 years? We will find out then! But for now, let's look at this year's results. We have to consider that this poll combines both Club Grayskull (Filmation) and Collector's Choice. That means we have to dip into the second stringers to flesh out the CG and CC lists. One thing that happened this time was that no New Adventure character ended up in the Top 60, BUT they still fell in positions right outside of of that list. When talking on the Org forums about the preliminary results, some fans were concerned that having a toy version of a NA character and a Jetlag cartoon version of the same character was serving to "split the vote." We found no evidence that this actually happened in any notable way. Still, we are offering a secondary list for hypothetical discussion that shows the ranking when combining all the unique votes between a toy and cartoon version of a single NA character. And since the rankings are so close from 31 thru 132, this means that the combined vote would push the character up the ranking. Of course, we could say the same for any character in the poll that has multiple variants. Regardless, the combined results are interesting to see. But for any concerned NA fan, don't forget that 2019 is the 30th anniversary of New Adventures! That might mean good things for NA figures. Do YOU want to help shape the future of the MOTU Classics line and what action figures we get? Then voting in this poll is mandatory for you! The results of this poll will be reviewed and considered by Super7 and the Four Horsemen. It covers nearly all possible, official candidates for 6" figures, over-sized items (beast, vehicles, etc), and accessories. This poll is open to EVERYONE. You do not need to be logged in or signed up to He-Man.Org to vote. So please spread the world about this poll to every He-Man and She-Ra fan you know who is interested in buying the Classics toy line. You can also win a free prize from Super7 in each Round just by voting and providing your e-mail address! More info is on the poll. and a special thanks to Adam Tyner, David "AdultCollector" Clark, and Danielle "Penny Dreadful" Gelehrter for their help in making this poll happen! Are the designs locked? I love and appreciate you guys for putting together some clear, concise method for Super 7 and Horsemen to follow, but I would be remiss to not mention something now: there are many of us who are saddened that new cartoon figures being introduced into the Collector's Choice line are being based on strictly filmation designs when Classics or Concepts design exist, or details can be otherwise added. These figures (the prototypes at least) are getting matte paint and everything, further differentiating them aesthetically. I see Acrobad, for instance, is a hard no, but I'd soften to his inclusion if based on the early concept art. If these are going to be new characters, they need to be able to stand toe-to-toe with the Classics stuff that's been established. We need additional costume ornamentation, metallic paint where need be, and reasonable accessories, not one-off filmation artifacts that take away from the character themselves (Lizard Man). Just this collector's 2 cents. I'm all in on 2018 series 1, both sets for multiple copies each, but I'm coming to the realization that as of now, I'm purchasing six filmation characters and 2 Classics characters and that saddens me as a Classics fan. What are the mission statements of each collection if they're just going to try to be mixed or not adhere to them at all? We were once told Collector's Choice are characters that have never had an action figure in the Classics style, and Club Grayskull are the A-list and b-list He-Man characters who had very different designs being made as cartoon action figures in their cartoon likenesses. I would prefer the 2 please be treated separately. We have Vultak, Batros, and Scorpia done this way, and no FilMation fan cried foul. Id love to see this maintained with Granita if early enough, and with whichever FilMation character we are lucky enough to join the ranks. I'd say that's up to the 4H and Super7 on if they want to deviate from or embellish the designs people are voting for. IMO, it would be very confusing to initially vote for a what-might-be design rather than the character design you are actually looking at. That would leave the door wide open later on for way too much interpretation, confusion and arguing about what should be done. Also, side note for everyone, that first question about packaging will have the answers tweaked here soon. Yes, I want the packaging to change. No, leave the packaging as it is. YES!! Thanks Val, I'll get voting! Sooo excited! May I ask a favor? I appreciate it you guys adding them by character and design. I agree that we're all selecting a specific look. 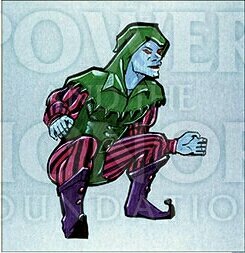 In the spirit of you having several beastman and Butthead and other Z-list filmation characters, can you please include Acrobad's Jester concept and Col. 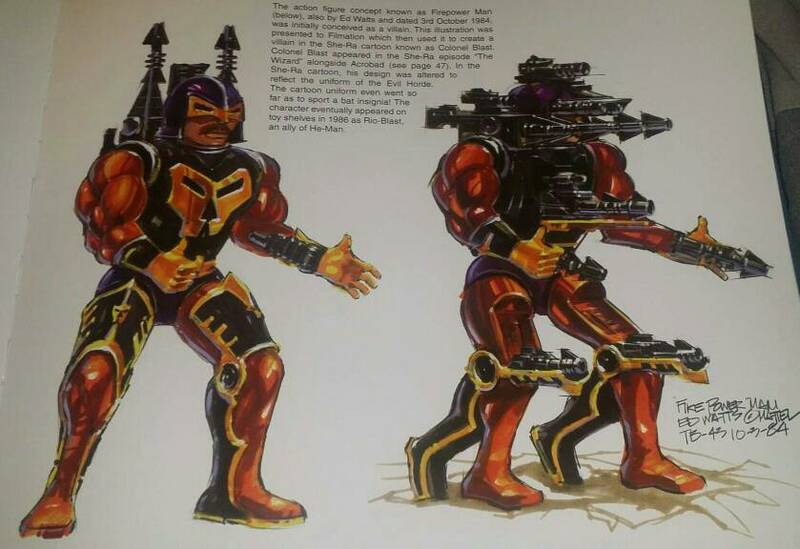 Blast's FirepowerMan concept designs? I would like these two characters, but they look more visually compelling as their Concepts. Thanks Val! Loved the variety of choices available. I voted for new characters only, I really don't want to see too many more variants and redone characters. Vote cast. I love that fans are involved. This is great! I'm so glad to have a new poll! Just some brief feedback: Filmation's David looks like he appears twice in the poll, once as regular David and once as young David (three times total if you count his adult variant too). Also the first question about packaging offers both options (new and old) but then asks only for a 'yes' or 'no' answer, so I'm not sure which option I'll be saying 'yes' or 'no' to. EDIT: Glad the question is yes for new packaging, or no to new packaging. That's what I hoped, I'm all for changing things up now! Last edited by gbagok; September 23, 2017 at 06:12pm. Be sure to read Book of Evil Part 2: The Bells of Doom, only in the He-Man.org Fan Fic & Media forums! Quick comment, the question about packaging is not a yes/no question, but those are the choice options, so it's kind of confusing. Moreover, what's the difference between David and Young David? Wow, with the current price tag at $35 plus shipping, my voting habits will be definitely different from previous polls. Voted! Can't wait for next round. Right, it's no longer "what figures will I pay $20-25 for on subscription", it's "what figures will I pay $35 for each, in a wave." But you can bet I'm super excited to see UK Comics characters on there (even if I'm the only one excited)! Last edited by Streamside; September 23, 2017 at 08:17pm. Also the first question about packaging offers both options (new and old) but then asks only for a 'yes' or 'no' answer, so I'm not sure which option I'll be saying 'yes' or 'no' to. I voted for mostly Filmation MOTU and NA Toy Versions. A few Filmation POPs too. "A Person Who Is Willing To Die For Someone Else, Has Nothing To Live For Themselves!" I voted for 200X variants (no surprise there), NA characters and Battle Woman 1. The Panther Men too. I wish we had the option for Jetlag Artilla and MYP Beast Man. It's cool some trollans are also on board in the 6inch voting! Waiting for Oncle Montork! Seeing so many d list characters made me realize just how few new characters I want. There are a few. But I'm more interested in getting Ultimates/Filmation/200X variants of a - c list characters. I voted I like taking these fan polls, they're fun. Especially knowing it may determine what figures we get in the future. Believe it or not, I got super excited at the prospect of a Cringer in Panthor disguise figure! I've wanted that variant ever since I saw it in the cartoon! More than happy to cast my votes. I want Bubblor! I'm glad that this poll is happening. I do, however, wish there was space to elaborate on the questions at the end of the survey- for example, I don't really care about the packaging, It's basically a non-factor, as long as it protects the figure well enough to get to me undamaged before I open it. For the MOTU Giants, I clicked "Yes," but there are only a handful of characters that I would buy. Even if they were limited to 100 characters, or something like that, I think being able to add a comment to these responses could provide them some valuable specifics. I love how thorough the character selections on this poll are!!! "I am The Mad Bubbler... breathe in the vapors of my madness!" Apart from the Cringer in disguise as Panthor vote, I was pretty brutal this time round actually going back and removing some characters before I put the vote through. Grayskull's Heir: I completely agree with you about voting habits being different to the last time I voted! I got my vote in. I voted yes on about 25 of them.